The Lions Club of Henley-on-Thames celebrated its 45th charter anniversary with a luncheon held today at the Red Lion Hotel. Henley’s club members were joined by Lions from Maidenhead, Slough, Burnham, Bracknell and Warminster. Lion President Pam Pitts spoke about the work the club does in the local community and the various local organisations and individuals it supports. 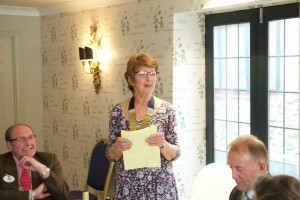 District Governor Alan Chapman congratulated the club on its membership and all the work it does in and around Henley. He cited his personal visit to the club remarking that he was very impressed with the fact that the Henley club members are involved in so many aspects of community service. Mayor of Henley, Cllr Lorraine Hillier, an honorary member of the club, thanked the Lions for all that they do for the community and said how much she has enjoyed the club meetings that she has been able to attend during her year in office. 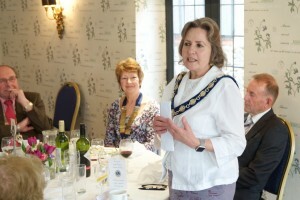 The mayor was accompanied by her mother, Mrs Shirley Hillier, who, by all accounts, thoroughly enjoyed the luncheon and is hoping to attend the club’s April business meeting.